Brian Cypher: ''untitled (two shapes twelve times and their echoed presence),'' 2011, colored pencil and graphite on paper, 22 x 30''. The Steele Gallery is one of Seattle’s best-kept secrets. Tucked within the classical atelier-style Gage Academy this month is a cohesive group show of painting, drawing and sculpture by Brian Cypher, Robert Hardgrave, Jenny Heishman and Kimberly Trowbridge. The “loom” is a conceptual launch into pattern, personal narrative, abstraction, and a lost or “broken” sense of history that emphasizes unmediated experience. 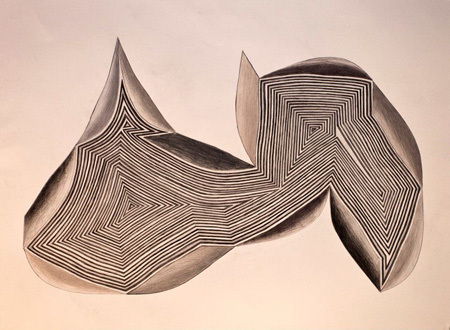 The intimate works are dense with geometric patterning, encouraging the viewer to linger in these sinuous mindscapes. The visual vocabularies of each artist sync and reverberate throughout the cave-like gallery (which is painted dark gray). The zig-zag vinyl stickers on Heishman’s aluminum foil “baskets” play on the weaving theme and echo Cypher’s drawing "untitled (two shapes twelve times and their echoing presence)," a monochromatic optical exploration of geometric and organic lines that looks like a flayed sedimentary rock. In Trowbridge’s "untitled (undone)" the figure unravels through shifting perspective and overlapping gesture, a meditation on the passage of time.